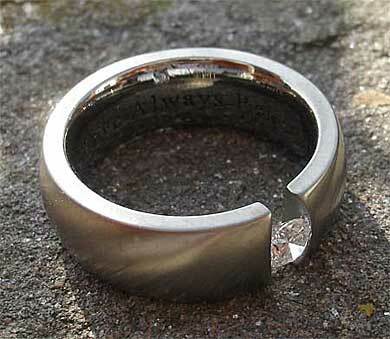 1/4 Carat Tension Set Titanium Engagement Ring : LOVE2HAVE UK! 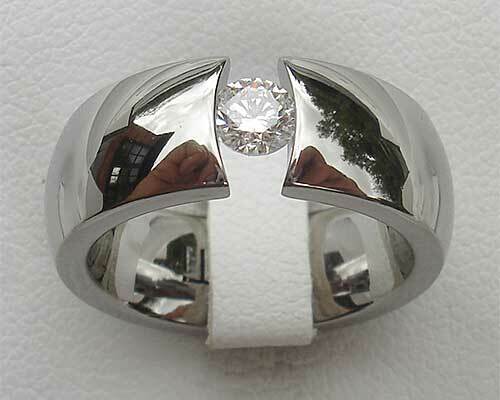 This titanium engagement ring is one of our larger diamond set titanium rings with a diamond size of 4mm (1/4 carat). The diamond is a brilliant cut SI G/H quality and the ring is 7mm wide. The profile is domed, and the tension setting comes engineered with a slight curvature where it meets the stone. It is also worth noting that due to the depth of the diamond the ring has quite a thick wall thickness, so is therefore quite chunky too. It is pictured here in a satin finish, but polished is also available on request. 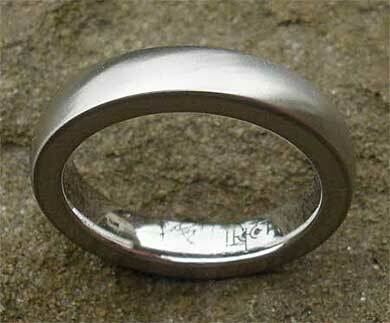 Finally, a matching plain band is available as a wedding ring, again please email us for further details. Please note that our tension set rings are aircraft grade titanium, used for its extra tensile strength, and crucial for holding the diamond securely in place. DO NOT buy a tension set ring unless it is made using this type of titanium. It is not practical to resize rings manufactured from this grade of titanium. It may be possible to resize up slightly (depending on the design of the ring) but not down.